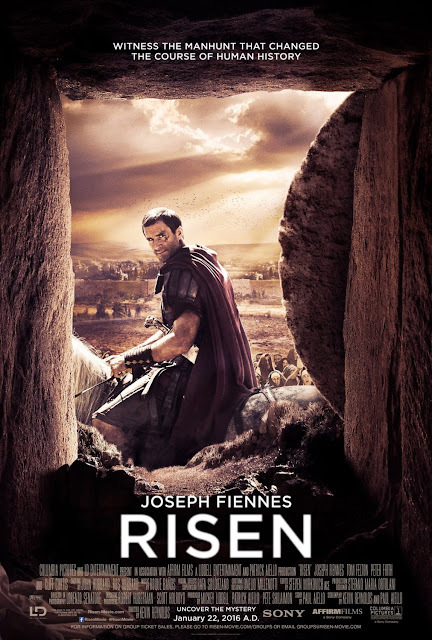 A Roman Tribune name Clavius (Joseph Fiennes) searches for the body of a crucified Jew named Yeshua (Cliff Curtis) that has disappeared from his tomb. The followers of Yeshua begin to spread rumors that he has actually risen from the dead, a rumor Clavius may discover to be true. BigJ and I have avoided the majority of religious films in the theater because we feel we cannot fairly judge them. Most of the time, the quality of these films are laughably bad, and if you don't believe us, see our review for "Left Behind." In addition, they are either movies that don't speak to us as individuals, or they are so exploitative, they make us angry. We took a chance on "Risen" because the trailers didn't make us want to crawl out of our skin. 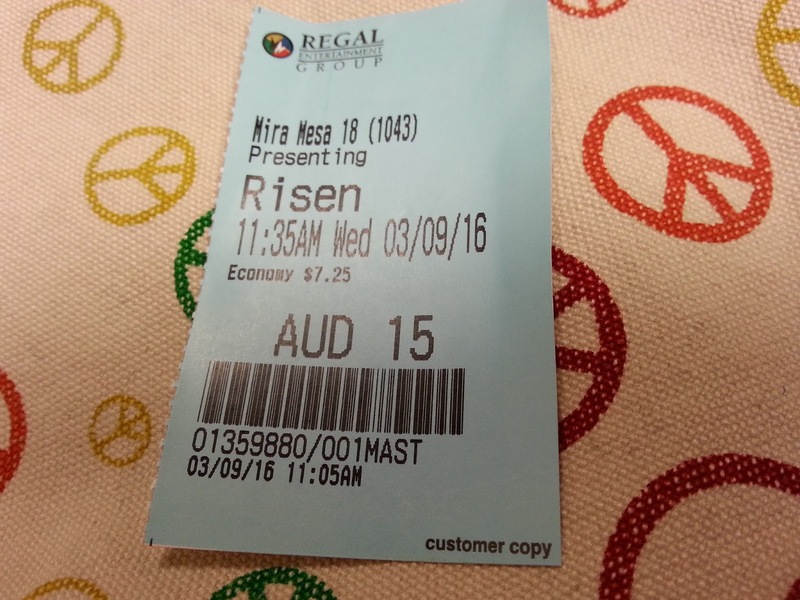 Sony's Affirmfilms specializes in faith based cinema, and "Risen" is their latest offering. This throwback to the biblical epics of old tells the story of a Roman Tribune named Clavius, played by Joseph Fiennes, who investigates the disappearance of the body of Yeshua, played by Cliff Curtis, the man believed by his followers to be the messiah. The film begins as an early first century crime investigation story. It shows the tail end and result of Yeshua's crucifixion, his entombment behind a gigantic stone wheel that needed to be moved by 7 men, and then displays open tomb with no body inside. This begs the question: has Yeshua been resurrected, or did his followers steal his body to further the rumors that he is in fact the messiah? Clavius interviews witnesses and digs up decomposing dead bodies throughout the city trying to find the body of Yeshua to prove these rumors to be just that. The first couple acts of "Risen" are, surprisingly, quite well done. The mystery and investigation are actually very riveting as the director keeps the answer to the above questions ambiguous for a good portion of the film. Early on, we see evidence supporting both claims as an unbelieving Clavius refuses to accept anything but facts, until he discovers he might actually be wrong. Joseph Fiennes does a solid job as Clavius, a man who is set on a task that puts him in an internal conflict between what he is looking for and what he is finding within himself. Tom Felton stars as Lucius, Clavius' sidekick, and is fine in his limited role. Cliff Curtis is also excellent as Yeshu, and we're happy those responsible for "Risen" didn't pull a "Gods of Egypt" situation and make everybody pale and blonde. Apart from the acting, where the film begins to unravel a little bit is in its third act. The conclusion is painfully obvious, given the name of the film, and a big reveal happens towards the end of the second act. From that point on, it sort of devolves into a religious sermon about faith and simultaneously removes any element of faith that may be required. What we would have liked to see happen was a full on leap of faith on the part of Clavius. Of course, this would have been a completely different movie, but we think it would have been infinitely better to leave things a bit more unexpected and ambiguous. The final act we are given kind of meanders a bit towards its eventual end that is content to retell a couple biblical tales which now happen to include the character of Clavius. In the end, "Risen" is a mostly enjoyable film despite both its predictability and its ending, though we can't say we expected less than what we got. The acting is solid, it has some genuinely great moments even with a more saccharine version displaying the good portions of the resurrection of Christ. If you've had doubts about faith based films in the past, this one is a good enough choice. One year ago, we were watching: "McFarland, USA"